We love when we hear of new food products on the market and get to try them on our blog for our readers. 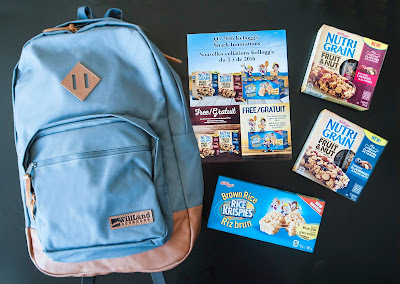 Brands are always improving their products, and Kellogg Canada has come up with a few more , just in time for Back To School. New to the Nutri-Grain portfolio, Kellogg Canada introduced Fruit & Nut Medley Bars – perfect for those living a fast-paced life who don’t want to compromise on great taste and seek real ingredients. The new Nutri-Grain Fruit & Nut Medley Bars are packed with real ingredients you can see and contain no artificial flavours or colours. Real, delicious fruits and nuts make up half the bar, along with crispy puffed rice and whole grain gluten-free oats. Available in two delicious flavours: Orchard Cherries & Almonds and Harvest Blueberries & Mixed Nuts. You can make snack time anytime with these scrumptious bars! We loved the boxes these were packed in as well- as they actually have a peek-hole window in them where you can actually see the real product through the opening! And, just in time for back-to-school lunch boxes everywhere, Kellogg’s Rice Krispies Squares will now be available with Brown Rice. These contain whole grains and made with the goodness of brown rice. NewKellogg’s Rice Krispies Squares Brown Rice Bars are low in saturated fat, trans fat free, contain no artificial colours, provide 8g of whole grain per serving (20g) and are a twist on a classic favourite. The new snack bars are sure to give kids a reason to open up their lunch boxes this back-to-school season! Gerry and I love both of these bars as they make a perfect healthy snack when one is feeling a bit hungry before lunch or before supper and perfect as well to take on the road when traveling! Their actually quite yummy too! Squares Brown Rice Bars, (2) Nutri-Grain Fruit & Nut Medley Bars and 2 Free product coupons. All Canadian entries all eligible. A random draw will be made on September 16, 2016 by Random. org from all entries received. Best of luck. Winner will be contacted on the draw date. I would love to try the new Brown Rice Krispie Squares. I follow The One Income Dollar on Facebook as Cheryl Andrews-Morreale. I am most excited to try the Harvest Blueberries & Mixed Nuts bars!! We always have snack bars in the house and I love finding new ones to try. I follow kellogg's on facebook as amber lynn young. I'm following your blog on facebook as amber lynn young. I like to try the Fruit & Nut Medley Bars the most. I have never tried the Nutri Grain Fruit & Nut bars so they would be my first choice! My kids favourite is Kellogg's Rice Krispies and I would like to try the Brown Rice variety because it is a healthier choice. Brown Rice Krispies would be a good healthy choice to try. I follow Kellogg's on facebook. I LOVE the other varieties of those bars, I can't wait to try the new ones! I follow Kellogg's Canada on Facebook! We would really love to try the brown rice krispies! Thanks for the chance. I would most like to try the Nutri-Grain Fruit & Nut Medley Bars. I like Kellogg's Canada on facebook. I like the one income dollar on facebook. I'd like to try the Nutri-Grain Fruit & Nut Medley Bars. I'm interested to try the Brown Rice Rice Krispies treats. I would like to try the Nutri-grain fruit and nut Medley bars. I want to try the Nutri-Grain Fruit & Nut Medley Bars -sounds yummy! I would like to try the Brown Rice Krispies. I would like to try the Nutri-Grain Fruit & Nut Medley Bars. I'd love to try the brown rice rice krispies squares! I can't wait to try the Nutri grain fruit and nut medley bars. I would love to try the brown rice krispie squares. Most interested in trying the Rice Krispy bars. WOW, rockstar, luv to try fruit nut medley. I liked FB @edmond238. Thank you for the awesomeness, the contest, and generosity. :) Pick me. I would like to try the Orchard Cherries & Almonds Nutri-grain Fruit and Nut Bar the most. They sound delicious. Love to try the brown rice krispies squares! We would love to try Kellogg’s Rice Krispies Squares Brown Rice Bars. We already love the original ones so these will be added to our snacks list. I'd love to try the Brown Rice Krispie Squares. I think hubby and I would love the blueberry nut bars while our son would want the brown rice kripies squares. I would love to try the Nutri-Grain Fruit & Nut Medley Bars. I follow Kellogg Canada on Facebook as Robyn Bellefleur. I follow The One Dollar Income on Facebook as Robyn Bellefleur. I think we would like the brown rice Rice Krispies.